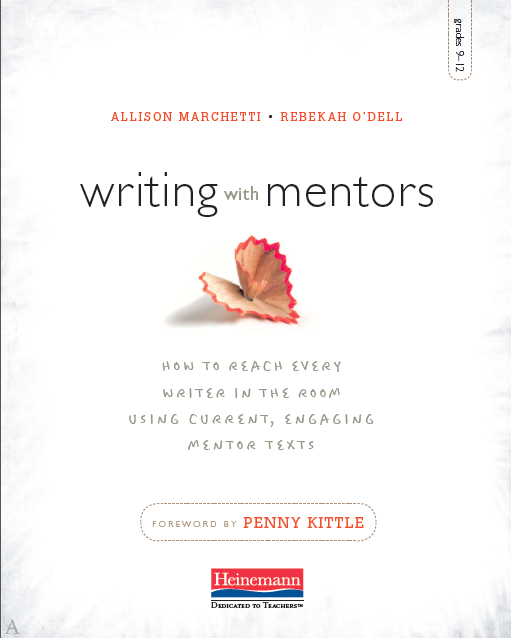 School is winding down, and summer is upon us, but Allison & I are just getting started as we gear up for the September 3rd release of our first book with Heinemann, Writing with Mentors. We are working on some exciting things to share with you as we get closer to the official launch! In the meantime, we are going to spend a little bit of time this summer sharing our top ten most popular mentor text posts. Our #10 post is a great place to start — “I Have Some Mentor Texts…Now What?” shares the process we use to introduce a new cluster of mentor texts, collecting a list of noticings with our students, and moving into explicit writing lessons. I do the study described below — a mentor text study — as the first writing workshop of the year. You’ve collected some awesome mentor texts to support your writing study. You’ve photocopied them and passed them out. How do we connect students with mentor texts in a way that will actually help them write? What are the first steps? Read the mentor text cluster like readers. Students need to reader like readers first — for understanding, for enjoyment, for the gist. For this study, I gave students all five mentor texts at once because I wanted to highlight their differences. (I don’t always do this — sometimes I dole out the mentor texts one at a time as they correspond to the writing lessons throughout the unit.) Since some of these articles and stories were a few pages long, I gave students 15 minutes of class time, and then they finished for homework. Go back and read each mentor text like writers, jotting down the interesting craft elements. I am not very prescriptive here — I don’t give students a requisite number of craft elements to find. I simply ask them to mark the craft elements they see (the pieces of how the piece is written) and to give it a name — any name that makes sense of what they are observe. Later, I will try to subtly infuse our conversation with literary language, but that’s not the top priority. I want the craft students notice to be useful to them, and it will be most useful if it’s in terms that make sense to them. Collect the noticings and translate. Once students have read the mentor texts like writers and made their own observations about the craft, I project the mentor texts on the board and we collect all of the noticings together in a master list. We don’t stop at simply identifying the craft elements, though. We try to translate each observed craft element into a “rule” for writing. Here’s why: say a student observes that the writer frequently uses dashes. This is a great technique to notice! However, if we leave it at that, many students will then go into their own writing and fill it up with dashes willy-nilly. We can’t leave students at the what, we need to push them toward the why — and translating our noticings into rules helps accomplish this. Instead of “The writer uses a lot of dashes”, we write “Writers use dashes to create longer, dramatic pauses.” This is a tip students can actually use. From here, I took their rules, and re-organized them into three big categories: Ideas/Detail moves, Structure moves, and Sentence moves. I wrote their rules on large posters in these categories and posted them around the room. 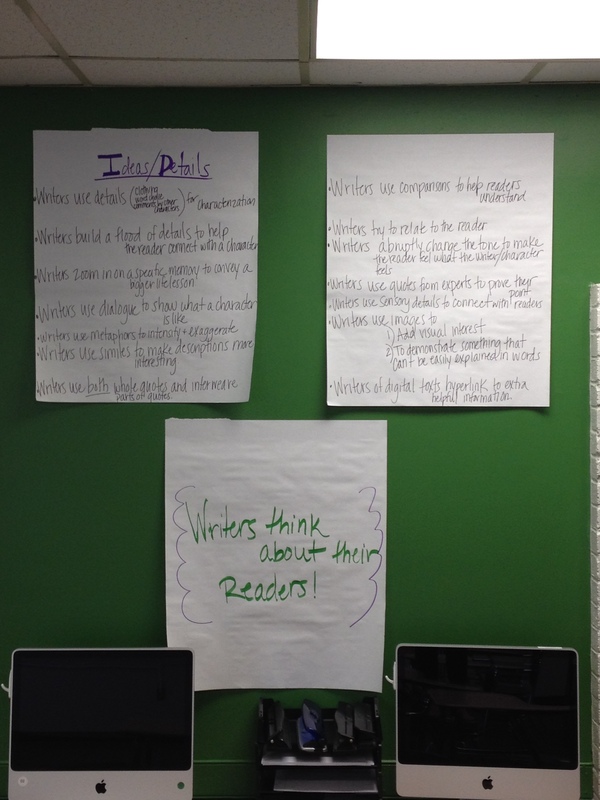 Students already had these rules written in their notebooks and mentor texts, but these posters serve as useful visual cues that students should be consciously thinking about these craft elements as they write. This process — reading like readers, reading like writers, collecting noticings, translating noticings into rules for writing — works when you are studying one mentor text or when you are studying five. It provides a starting point for teachers and students alike. Students walk away from these lessons with tangible techniques to try in their writing and professional examples of writers doing them well. 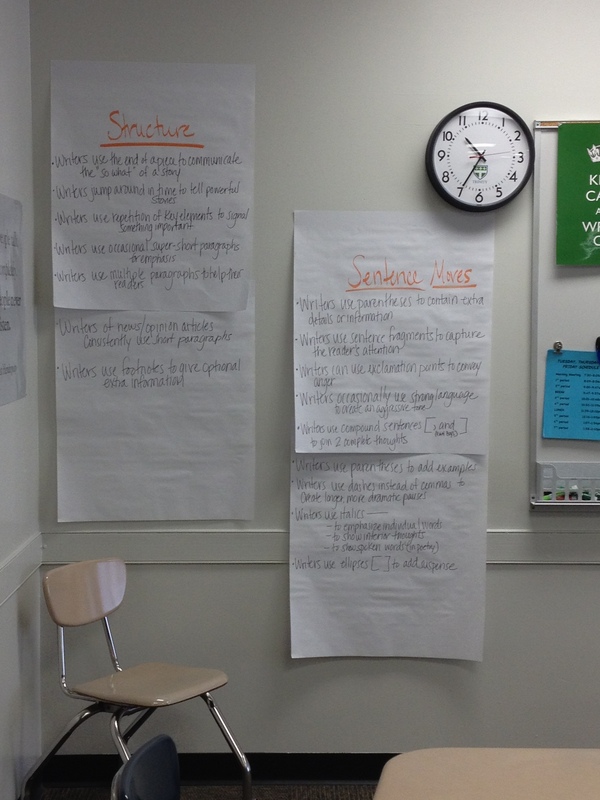 Teachers walk away with a sense of what their students are interested in as well as ideas for writing lessons that might be taught throughout the unit. What are your first steps when you put a mentor text into the hands of your students? What works? What doesn’t? How do you connect the dots between mentor text study and student writing? Leave us a comment and share your ideas or find us on Twitter @rebekahodell1 and @allisonmarchett. 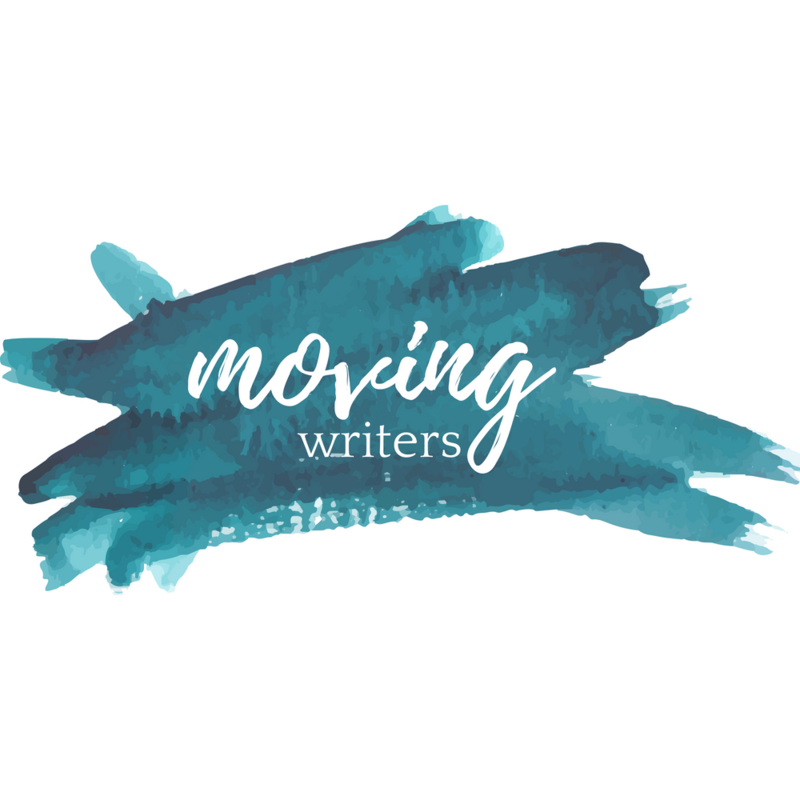 Previous PostOur Top 3 Tips for Using Your Summer to Plan Next Year’s Writing Workshop Next PostJoin the Moving Writers Conversation on Facebook!